Happy Thanksgiving from the BITM family to yours. We all know this time year is dumb BUSY (hopefully in a good way though). But with 2017 almost in the rear view, we had to make sure we got this Big K.R.I.T. review in. The Mississippi native dropped his third studio album, 4eva Is A Mighty Long Time, at the end of October. This is his first double disc LP. So sit back, relax, and peep this KRIT review on your (hopefully) day off. So what Big KRIT did was break up the LP into two discs. 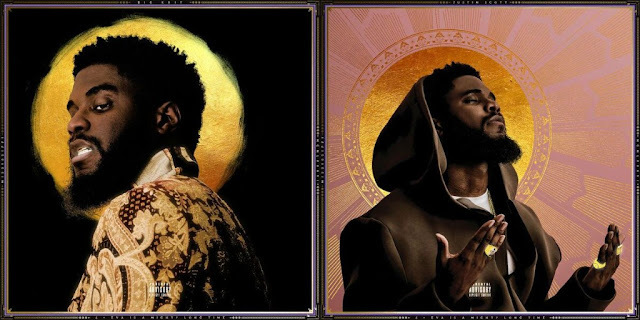 The first "disc" is written from the Big KRIT persona. And the second disc is from Justin Scott's perspective (Justin Scott being his gubmint name, gubmint). The first 11 tracks give you what you expect from KRIT. Braggadocio bars, dope metaphors and trunk rattling beats. On the track "Big Bank", KRIT is able to go bar for bar with the king of swagger and bravado, T.I. This energetic joint hits you with lavish lyrics and a Mannie Fresh "outro" that transitions you to the next sub shaking track. But one of my early favorite tracks is his "smoke record" "Layup". On the surface it sounds like a typical smooth melodic track. But once you listen to the lyrics you hear verses full of struggle sandwiched between the more positive hooks. A layup is suppose to be an easy point. So while KRIT is enjoying the layups he's had in life, he is also aware of the harder times he's gone through. The final track on the first disc is "Get Away". This is another favorite of mine, classic KRIT. In a couple of verses we get a plethora of complex themes wrapped in harmonic flows. To me this is quintessential KRIT. Music that is accessible because of his musicality while at the same time littered with intricate lyrics and strong subject matter. In an interview, KRIT said with this song he wanted to "have something that knocks and bounces but still give you good medicine". That's KRIT all day. The second Justin Scott disc dives even deeper into the introspective and personal side of Big KRIT. The sans rapping intro titled "Justin Scott" is essentially an old school, soulful sounding instrumental with the singing of "forever is a mighty long time". The rest the disc touches on topics like: religion, relationships, love, hate, depression, anxiety, addiction, family, fame, faith, death, race, police, and wealth (among others). Songs like "Price of Fame" address KRIT's fears of dealing with fake friends with ulterior motives. And his greatest fear of the problems that come along with fame and his family interactions. The final track, "Bury Me In Gold", attempts to address the complicated nature of material wealth. KRIT questions the duality of wanting for an object that is so valuable and at the same time completely worthless in the big scheme of things. The gold chains and rings that he yearned for in past will mean nothing when he passes away. While the topic is dark, KRIT is able to put a more hopeful vibe on the track. Infusing it with faith and ending with KRIT speaking more on the matter. The first disc gives us the southernplayalistic KRIT, full of cars, flash and funky beats that shake the pavement. The second gives us a more intimate look into the private life of the man, Justin Scott. If your a fan of KRIT, this album is for you. The first disc is more typical of what you might expect from the emcee/producer. With features from other southern artists, like the aforementioned T.I., Bun B, Pimp C (! ), and CeeLo Green. You get a blend of that funk, jazz, soul and bumping tracks. On the second disc you get more melodic and bluesy sounds, except for the gospel infused "Keep the devil Off". KRIT makes sure that we end the year on a good note (and not on a Cardi B one, you know the song). While I think the project would have benefited from some editing (double disc albums are tricky), the overall album is a success. If you haven't taken this one for a spin, make sure you round up 2017 with it in your speakers. 4eva Is A Mighty Long Time is definitely something to be thankful for. Sorry, had that one in back pocket all day.